With white sand beaches, thriving nightlife, opulent royal palaces, gilded temples and modern skyscapes, Thailand offers something for every kind of traveller. Enjoy the sand between your toes and the sacred streets of this beautiful nation on our amazing Thailand packages. Officially named the Kingdom of Thailand and once known as Siam, Thailand is a southeast Asian nation in Indochina surrounded by Myanmar, Laos, Cambodia and Malaysia. The country is popular among Indian tourists with Thailand Tour Packages being some of the most sought after holidays in India. With great food, a tropical climate, fascinating culture, majestic mountains and great beaches, Thailand is a magnet not just for Indians but for travellers from across the world. One of the most popular tourist destinations in the world, Thailand is known as much for the luxury thailand hotels as it is for the spartan beach huts in Koh Samui. With elegant fine dining restaurants to streets stall selling mouth-watering local fare and from bustling metropolises to rustic villages, the best Thailand Tour Packages will showcase the best of this beautiful country making for the holiday of a lifetime. The capital of Thailand, Bangkok, is a bustling, almost frenetic city known as Krung Thep among locals. 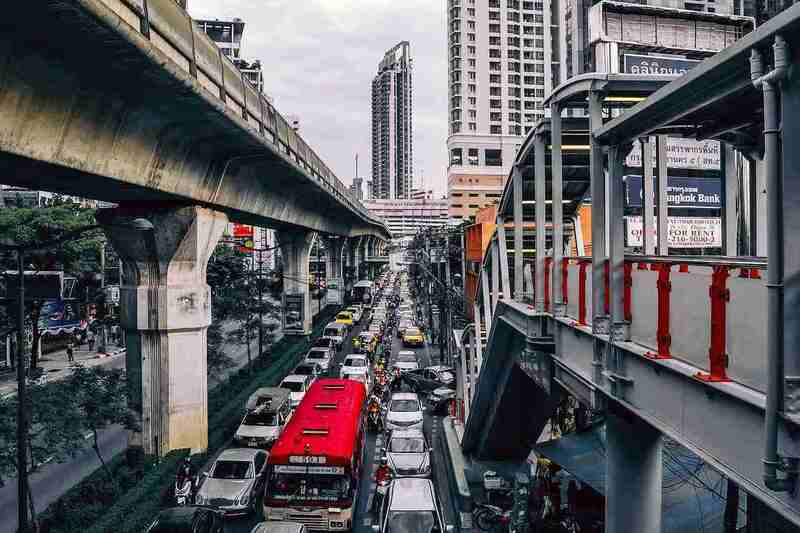 A city of contrasts, you could shop at a luxury mall selling haute couture and hail a tuk tuk to a floating market for some hearty Thai food, all in the same afternoon. Bangkok was founded in the 19th century as a small trading town on the banks of the Chao Phraya River. In the 200 hundred years since then, the town has become a thriving city with magnificent Buddhist temples, royal palaces, colourful bazaars and the world famous floating market where good are bought and sold on quaint wooden boats. On our Thailand packages, we take visitors on a tour of the city that includes all of the city’s main attractions, each with its unique story and contribution to Thai history. You will visit the Grand Palace, the most sacred site in Thailand, on our Thailand Tour Packages. Built in 1782 it is the official residence of the Thai King for over 150 years. The Grand Palace is a must see sight that no trip to Bangkok would be complete without. Within the palace complex, lies the Temple of the Emerald Buddha, which contains the small, very famous and greatly revered Emerald Buddha that dates back to the 14th century. On your visit to the Palace you will have the opportunity to visit the Abhisek Dusit Throne Hall where the antique throne of the Thai king is located. Another uniquely Thai experience is eating from a floating kitchen. Part of most Bangkok’s renowned Thailand packages, Damnoen Saduak Floating Market is perhaps the perfect place to buy some fresh coconut water and steaming hot noodles off a wooden boat. Visiting such markets is a perfect way to savour the authentic rural way of life In Thailand. While in Bangkok, we recommend making a cruise of the Chao Phraya River, a mainstay of Thailand Tour Packages, a part of your itinerary. Sail on the river after nightfall and take in the city sights, all while enjoying a sumptuous dinner on the cruise. If you would prefer getting into the heart of things, head to one of the city’s lively night markets and shop till dawn. Head to Khao San Road after dusk for great food, bargain shopping and quintessentially Thai nightlife. For a glimpse into Thai Buddhism, visit the Wat Pho Temple and pay your respects to the Reclining Buddha. Wat Pho harbours a fascinating collection of murals, inscriptions and sculptures that delve into various subjects, from warfare to astronomy to archaeology. The vast temple complex also contains a landscaped garden with stone sculptures, stupas adorned with glazed porcelain, and a souvenir shop. A short drive from Bangkok will take you to the vibrant seaside resort of Pattaya, one of the best places to visit in Thailand. The beaches of this beautiful coastal town are brimming with sunbathers and water sports enthusiasts all day long. As the sun sets, the beach bums turn into party animals and take to the streets. Pattaya is known across the world for its nightlife with nightclubs, cafes and pubs catering to a city that never sleeps. Thailand packages to Pattaya often include day trips to Coral Island, an excursion you absolutely must not miss. This small piece of paradise is a short boat ride away from Pattaya but a far cry from its hustle and bustle. The unspoilt beaches and clear waters make for a fantastic water sports destination. Spend the day snorkelling, jet skiing, banana boat riding and parasailing on your trip to Coral Island. Phuket, in the south of the country, is one of the most popular beach destinations in the world. With white sand beaches, crystal blue waters and swaying palm trees, Phuket finds itself in most Thailand packages. An emerald green tropical paradise, the island has something for every taste and budget. 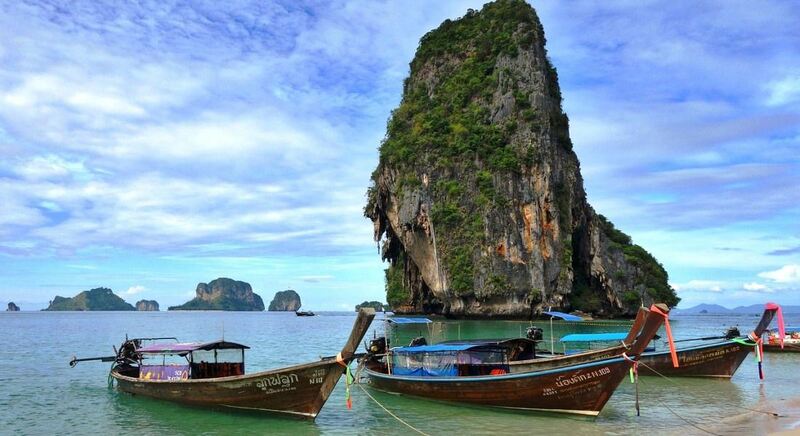 Phuket is surrounded by several smaller but equally breathtakingly beautiful islands including the famous Phi Phi Island. With high cliffs and dense jungle that spills on to the beach, Phi Phi is the crowning glory of Phuket. Thailand packages often add a leisurely cruise on Phang Nga Bay to their itineraries. The stunning bay, made famous in the James Bond movies, stands out for its towering limestone cliffs peering out of bright green water. Take an island hopping tour in Phuhttps://blog.akbartravels.com/top-5-beaches-will-get-phuket/ket, the perfect way to see the picturesque islands that litter the Andaman Sea. Among these islands are Phi Phi and Similans that are an essential part of our Thailand Tour Packages. Make your way to the FantaSea Show for some Las Vegas style performances. Watch trapeze artists, live elephants, pyrotechnics and Thai song and dance, reminiscent of Bollywood movies, for a fantastic evening out in Phuket. The seaside town is also renowned for its elephant sanctuaries. 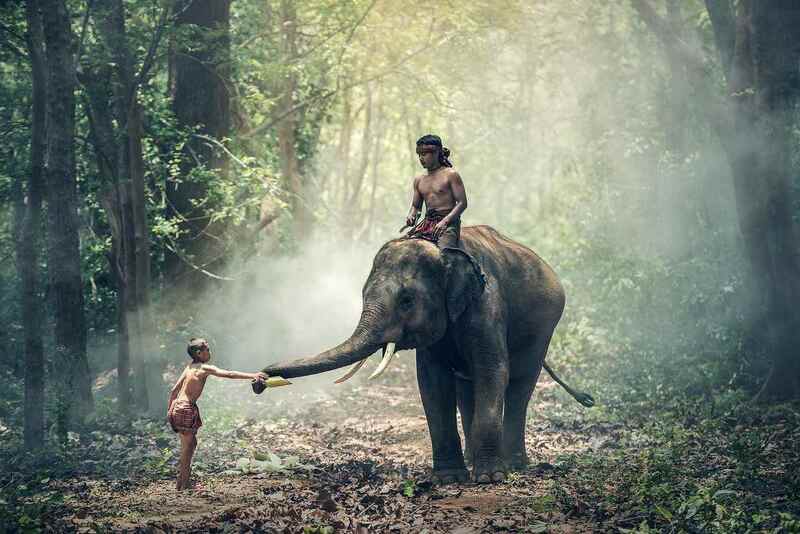 You can interact with the pachyderms in an ethical way in these sanctuaries while feeding and bathing them. Before you leave Phuket, do visit Old Phuket Town, a splendid example of Sino-Portuguese architecture with charming cafes, museums, shophouses and colourful colonial mansions. A walk through the town is a wonderful way to learn about the island’s history and heritage. Koh Samui, Thailand’s second largest island, finds its way into a myriad of Thailand Tour Packages. Whoever is the targeted audience, whether the fashionable elite or the backpacking adventurers, Thailand packages bring tourists to Samui Island in droves. Known for its azure waters, fine sands and palm fringed beaches; the island is both tranquil and lively. Enjoy the rustic Fisherman’s village, the pleasant Lamai Beach and buzzing Chaweng Beach on your trip to this heavenly stretch of sand. Visit Turtle Island for the country’s best scuba diving facilities, crystal clear waters, coral reefs and of course, turtles. 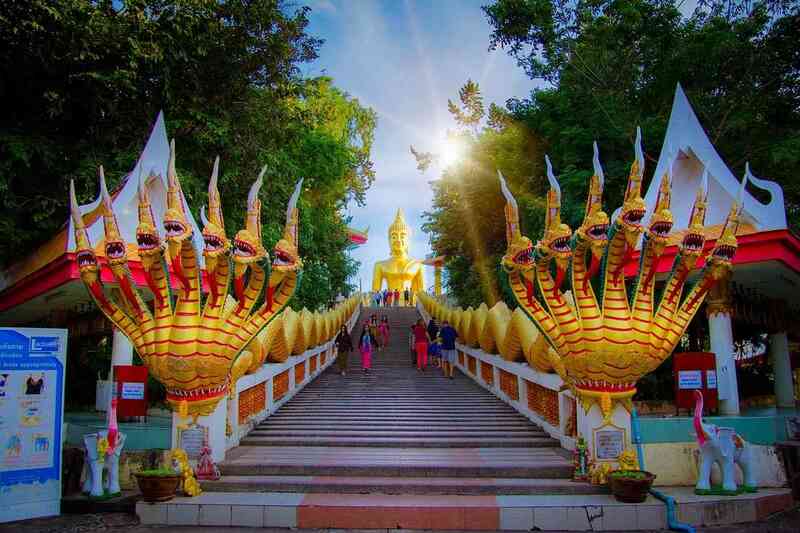 Koh Samui’s best known landmark, frequented by most Thailand Tour Packages, is the Big Buddha Shrine. The 12 metre high golden statue of the Buddha is visible from miles away. Visit the main shrines and the several smaller ones that surround it before you load up on trinkets and lucky charms at the street stalls surrounding the temple. Namuang Waterfall is another attraction in Koh Samui, made popular by Thailand Tour Packages. While the island is littered with waterfalls and brooks, the two at Namuang are by far the most picturesque. The trek to the falls is scenic and the site itself is one of the most beautiful ones on the island. The Waterfalls are in the midst of a lush jungle, with the water gushing down distinctive purple rocks, into a serene pool below. The area is frequented by picnickers and trekkers on Thailand packages looking for a spot of bliss on the island. Thailand packages to Koh Samui will almost certainly include a trip to Ang Thong National Marine Park. Located in the Gulf of Thailand, the park is made up of 42 islands, each with thick, tropical jungle, emerald waters, sandy beaches and lofty limestone cliffs. You will find a rich variety of exotic wildlife and sea creatures to look at and admire at Ang Thong and a host of activities to get the adrenaline soaring like snorkelling, hiking, sea kayaking, diving, and sun bathing by the sea. The park is home to a restaurant and simple bungalows for overnight visitors, should you choose to soak in the sights longer. With its sylvan landscapes, seaside treasures and fascinating cities, Thailand is a joy to visit and explore promising great food, spectacular sights and memorable experiences. At Akbar Holidays our carefully curated Thailand packages showcase the very best of Thailand and never fails to delight the lakhs of happy customers who chose to holiday on our Thailand Tour Packages.